Google text ads have evolved over the years. We went from 1 headline and 2 description lines totaling 95 characters total to now having 270 characters to communicate our key messages. On top of that, Google has added new ad extensions over the years, and text ads now take up more real estate space on Google than ever before. The most recent expansion to ad copy added a third headline and a second description line. However, some of my clients are still seeing better results from their old school, shorter legacy ads, and we are continuing to run them in select ad groups alongside expanded text ads as we test new headlines and descriptions. There were some advantages of a compact ad. Fewer ad characters meant having to really think through what is most important and communicate that in a concise way. Many people, myself included, are in a hurry and not about to read every line of every search result we see. Also, the extra ad copy space we now get does not mean that our customers will actually read every line. As a result of so much copy space + ad extensions, many ads can now look crowded and confusing, and our key points can get lost. So how do we make sure we take advantage of every field Google gives us but not confuse our customers? Enter AD VARIATIONS. This is a much underutilized tool that can help you make sure whatever expansions or copy changes you are considering will have the desired effect. And if not, not to worry, you can just end your experiment and test different copy and hypothesis. 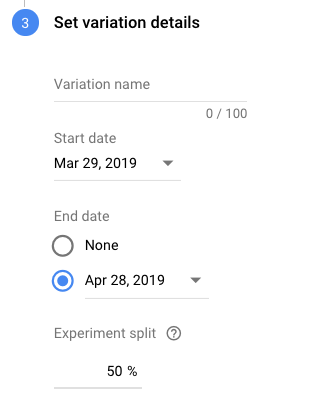 To get started, make sure you are in the All campaigns portion of your Google Ads account, From there, go to Drafts & experiments and select AD VARIATIONS. Click on + NEW AD VARIATION to start creating an experiment. On step 1, you will select your campaigns and filter ads. For example, you can test how an ad with just one specific description performs when you add a third headline and a second description. On step 2, you’ll choose the type of variation you’d like to test. In our case, we’d like to test if adding extra headlines and descriptions will be beneficial, so we will choose the “Update text” option. Now, we just need to come up with some extra copy. We won’t need to make changes to Headline 1 or Headline 2, so we will leave those blank and only fill in Headline 3 and Description 2 fields. On step 3, you’ll choose your variation details, including a name for your test, run dates, and experiment split. How long you’ll want to run this experiment depends on how much traffic you get, but a good rule of thumb is at least 2 weeks. Make sure to check in on your experiment at least once a week to see how it’s performing. In case you notice a significant negative impact right away, you might want to end your test early. If there is a blue star next to your data column, that means your data is statistically significant for that metric. If it is not statistically after a few weeks, you likely need more time and traffic, or you may want to test a different variation. My experience with using ad variations is that at least 50% of ad copy expansions we consider do not produce better results compared to our original copy. Why not test and understand what the impact will be before flooding your account with more text? 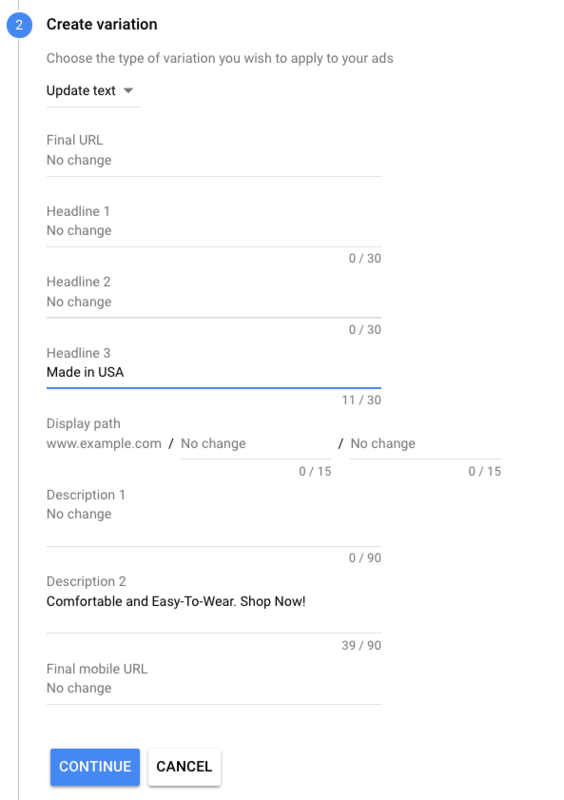 This entry was posted in Ad Text Optimization, PPC, ROI and tagged expanded text ads, google ad variations on March 29, 2019 by kristina.